If you are a business owner or creative professional who would like to be at the next level then working with me personally can yield great results. I will help create a plan of action, hold you accountable to your goals, and suggest new and creative ways to get where you want to go with a results based approach. Alternatively, if you want your social media done right, but don't have the time to do it all yourself I do offer full service social media management for select clients. Rivka's expertise in marketing and willingness to listen and find solutions that fit our company is invaluable. We have learned that a monthly conversation to focus strategy, along with setting goals is important to keep us from straying toward distractions. I know the importance of social media, these systems are crucial in how I market homes for sale as well as market myself and my business. This is where Rivka comes in and has allowed me to relax knowing that my "online" presence is covered by another professional who takes her business as serious as I do mine! "She's enthusiastic, she's energetic, she knows what she's talking about, and she's there to help you succeed at what you want to do." Rivka brings a wisdom and understanding about how business works in the real world as well as the cyber world. The way she breaks down how social media works, will have you feeling like an expert even if you don’t know what a “twitter” is. Rivka quickly grasped an understanding of who I am, what my business is about and whom I’m trying to attract as clients. She helped me see the role of social media in my business and how to maximize my time and energy in that arena. 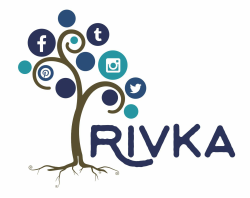 If you work with Rivka, you will come away with not only the nuts and bolts of social media, but something much more valuable. That is a thorough understanding of each piece of the social media puzzle and how they fit together to enhance and increase your level of authentic connection with your audience.